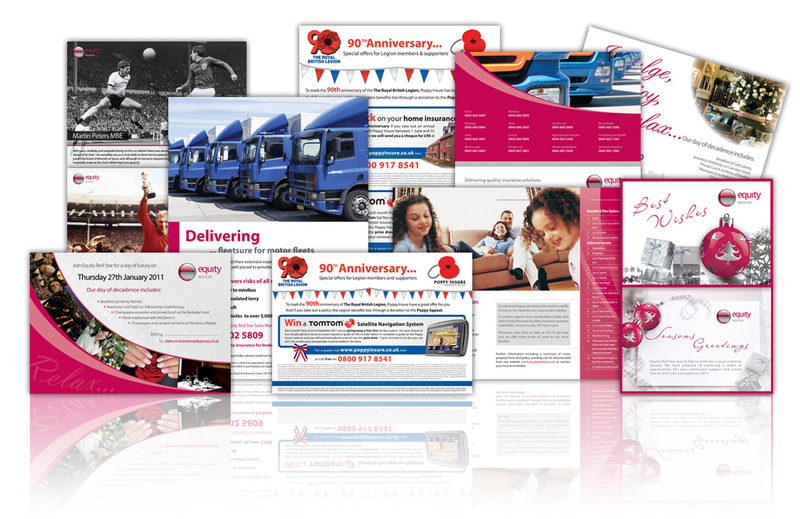 With over 10 years experience in the design and print industry, we have built up trust with 100's of businesses across the UK and overseas. 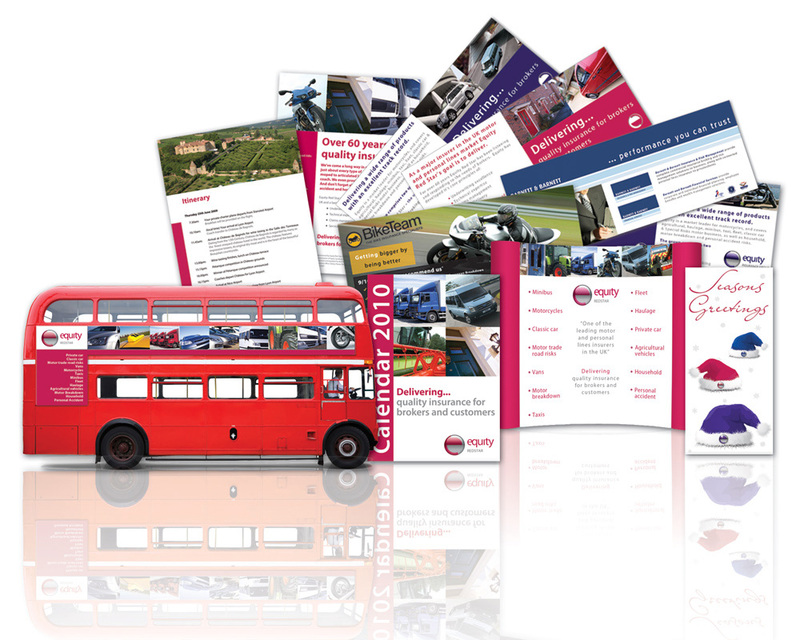 Our passion and credibility has lead to us being one of the most prominent design and print agencies in the UK. Please feel free to browse a selection of our testimonial clients below, for a taste of what we can achieve for your business. We have built a trusted relationship with some of the UK's biggest names including NHS, Triumph Motorbikes, Cancer Research, IAG and many more. We very much enjoy working with startup, small and medium size businesses, as we are passionate about creating and improving brands through our team of experienced and competent designers. Armed with our designs, their passion, determination and business prowess, have now secured their place in the telecoms industry with a Gold Partnership with communication giants... Vodafone. 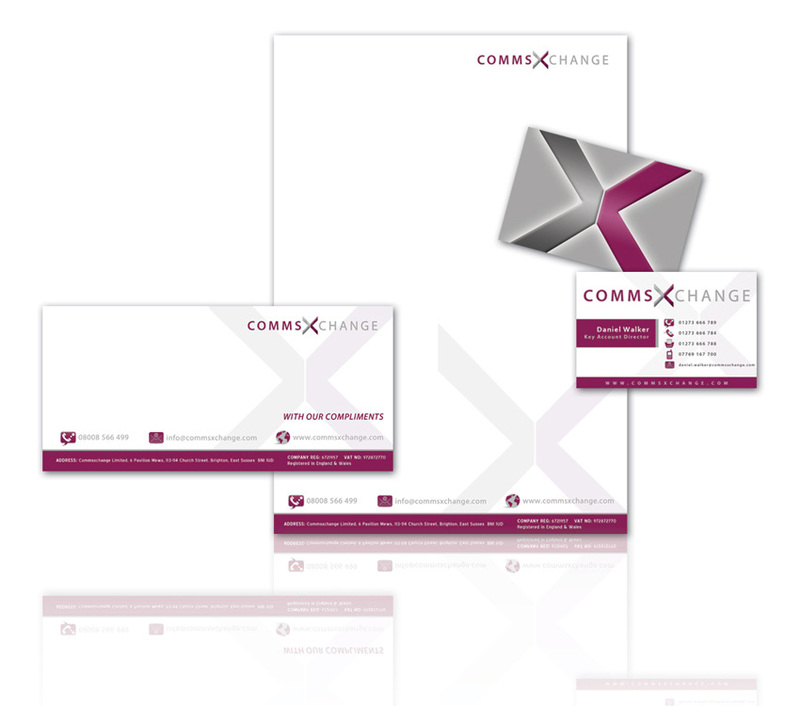 CommsXchange first came to us as a new startup company and so needed an entire brand created. Working closely together with the client we created a logo design that stands out from the crowd and appeals to their target demographic. 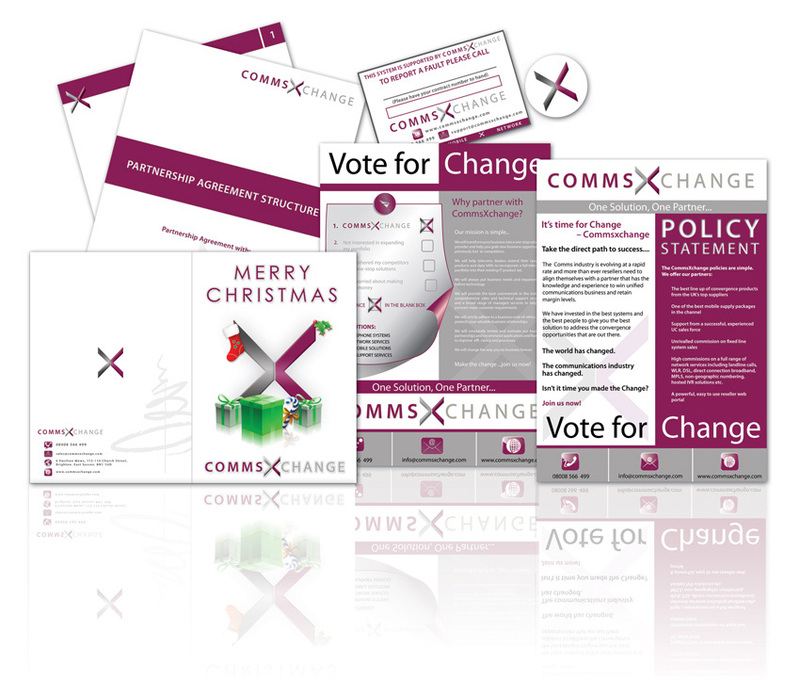 CommsXchange have since asked us to design their web site, business stationery including spot uv business cards, letterheads and comp slips and a whole host of marketing items. We also manage their email accounts and provide website hosting and maintenance. What did they say about our work..? "I would just like to say a huge thank you for the outstanding web design, logo design work and service your team has provided." 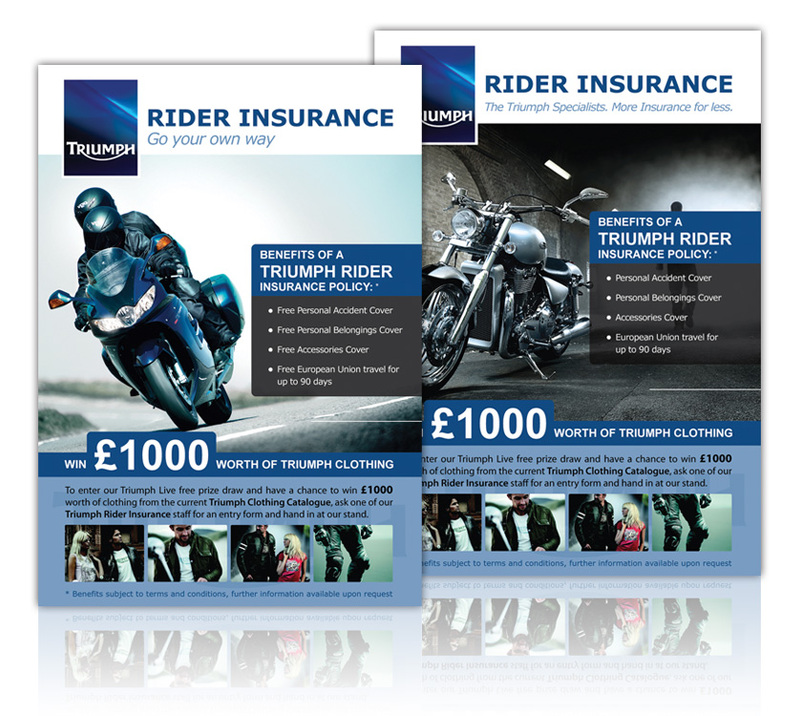 "Our marketing and advertising campaigns are working brilliantly thanks to your first class designs." "You've done it again, our stationery and Christmas cards look amazing. Thanks again for your hard work." 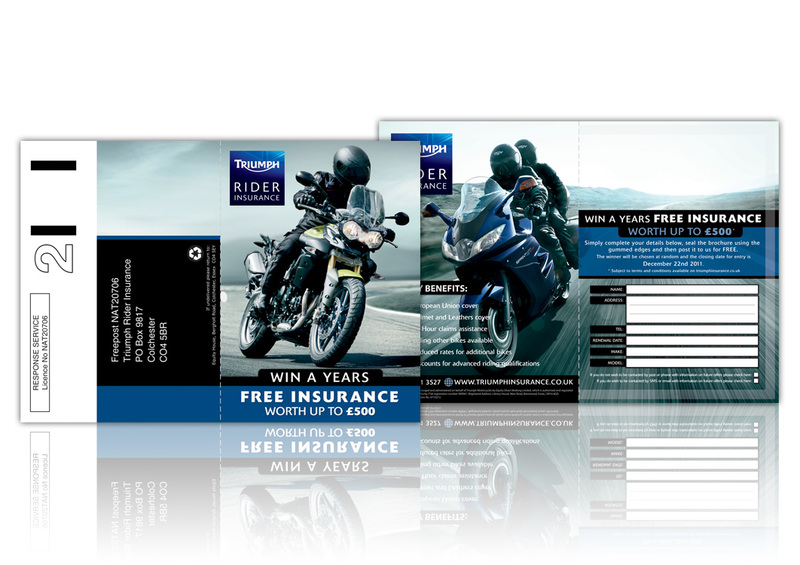 Working with Triumph has been an absolute pleasure for the team, from our initial first project of A1 & A0 poster design and print to building a lasting design and print relationship. 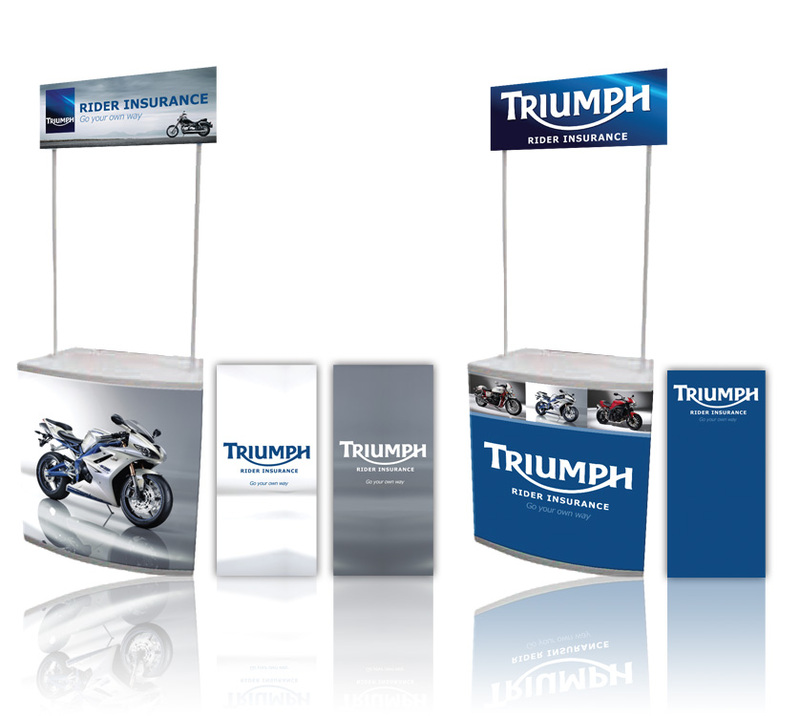 The success of the first project lead to Triumph asking us to design and print exhibition material including exhibition stands, rollerbanners and flags to various marketing materials including folded sealable brochures for competitions. "The posters are great, everyone here is really impressed with them, we’re very happy with the design, so thank you for that." "Thank you for the quick turnaround on this. I’m very happy with the design so far and very happy with the new look." Charlie and the Chocolate Fountain had a great company name and were great at what they did but lacked the brand, web site and marketing materials. We set to work and produced the logo design and web design they desperately needed to expand, as a result they are now enjoying a huge rise in web visitors, enquiries and sales. 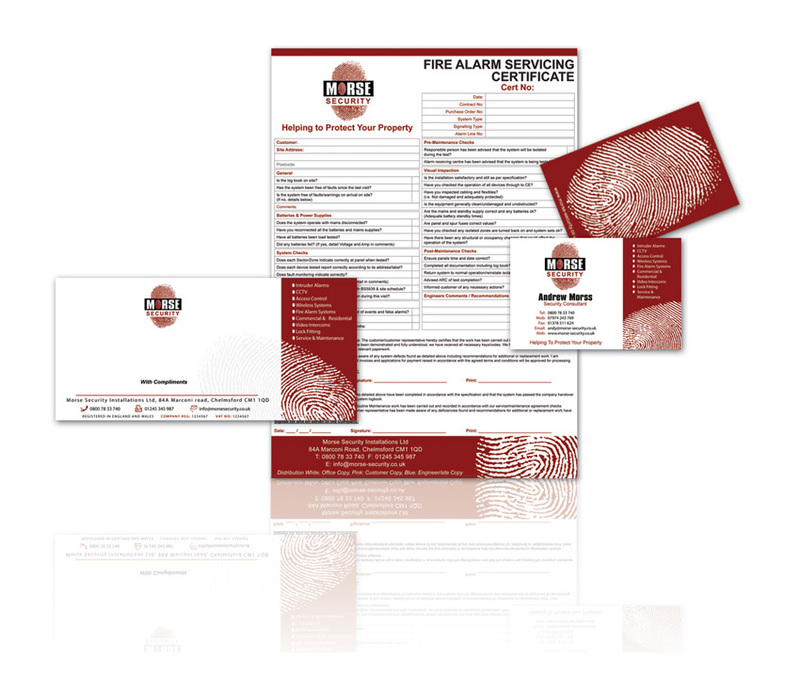 Our strong relationship then continued to grow by designing marketing materials, clothing and business stationery for print including business cards, letterheads and comp slips. "Your designs and service has exceeded all our expectations and we'd like to thank you so much for all your hard work. The quote requests and sales we have seen through the web site over the last few months is amazing and so promising for the future. We didn't realise the potential of search engine optimisatoin when matched with a fantastic web site, WOW! We look forward to working with again and again as we grow." "I think the first supplement is excellent – thank you." "They look really good. Thanks for getting them done so quickly." "Many thanks for this and your hard work getting this together so quickly. It’s perfect!" 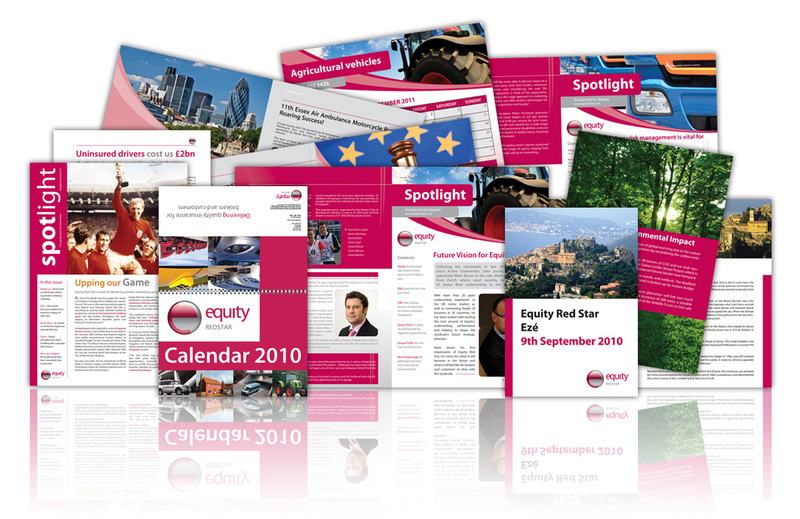 IAG & Equity Insurance Group comprises of many divisions including Equity Red Star and Equity Direct Broking and is widely recognised as a benchmark for service delivery, technical expertise, claims management and underwriting excellence. 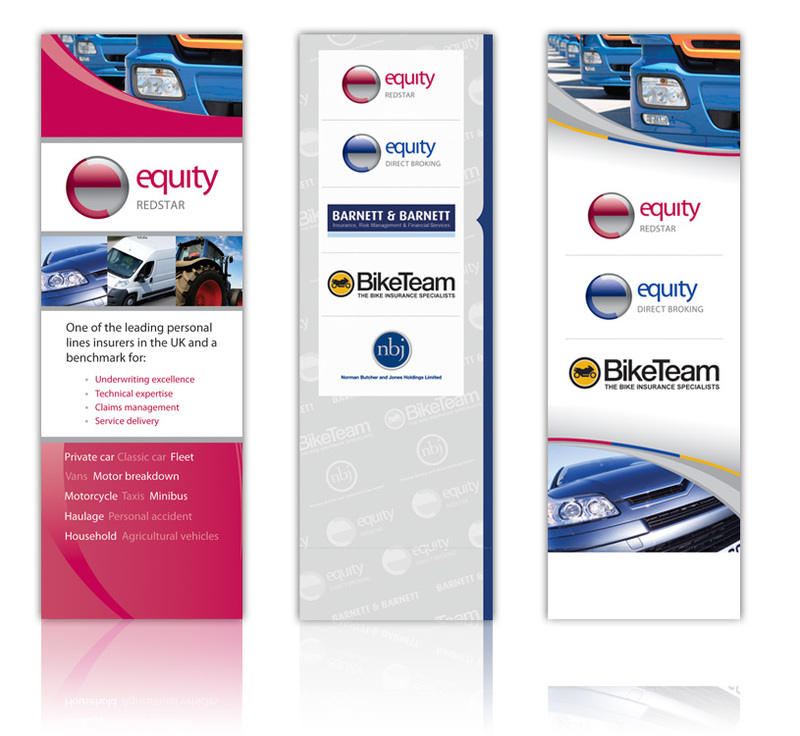 We work closely with Equity and provide assistance with various forms of branding and marketing including trade press adverts, calendars, corporate Christmas cards, pop-up banners, display stands, business stationery, bespoke campaigns and quality printing. "Designs were all fab as usual! Thanks for all your help on these projects especially at short notice!" "Many thanks for all of your work and the very quick turnarounds Sophie." "I love the redesigned ‘In our own words’ supplement; please apply the page turning feature and return." 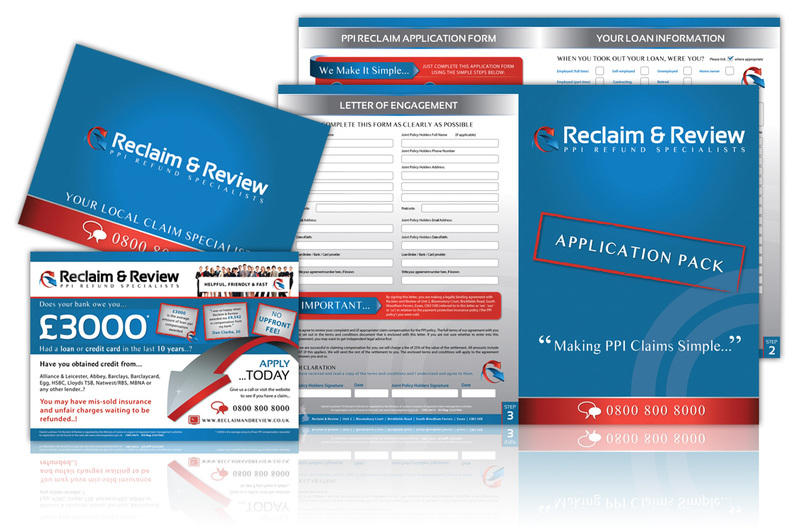 Reclaim and Review came to us to completely refresh there out dated branding and design work, they were desperately unhappy with there current designers and after meeting with us decided to give us a chance. We set to work with a new fresh but corporate logo design, from there we developed the new web design, company stationery, flyers, application packs and more. "Being heavily let down by our previous designers we were skeptical to say the least, however I have to say from the initial logo concepts we immediately felt comfortable and that we had made the right decision this time round. Not only was our brief met with distinctive execution, but the design flair you added that we could never have imagined was perfect. 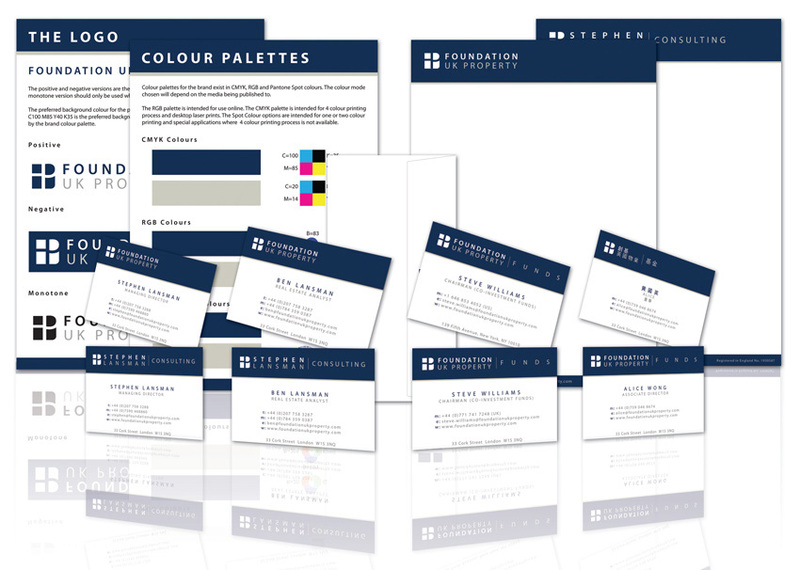 Our brand is now seamless across all materials including the web design, stationery and application packs and the final printed products exceeded our expectations. Please pass on our utmost thanks to the team and we very much look forward to working with you in the future." 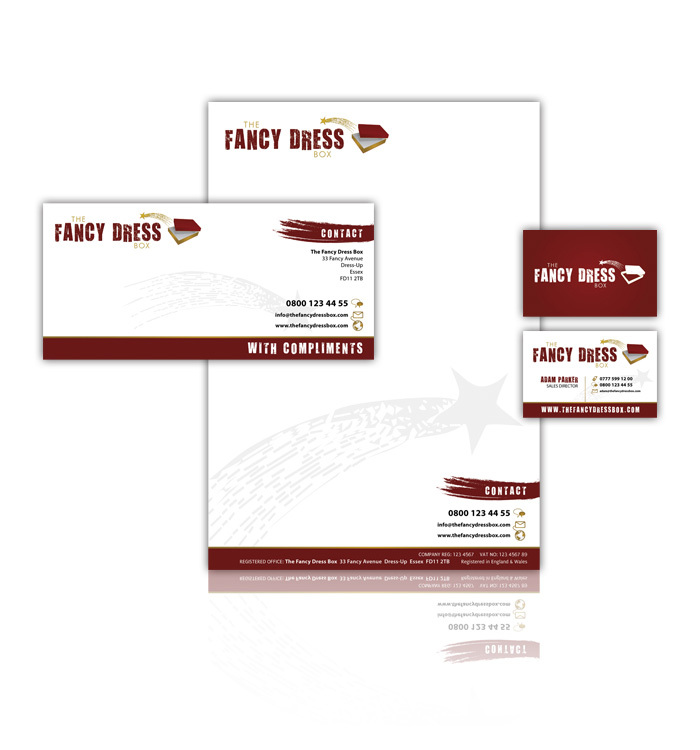 The Fancy Dress Box had an idea for a new company but needed the expertise of a design agency to get them up and running with a simple logo. 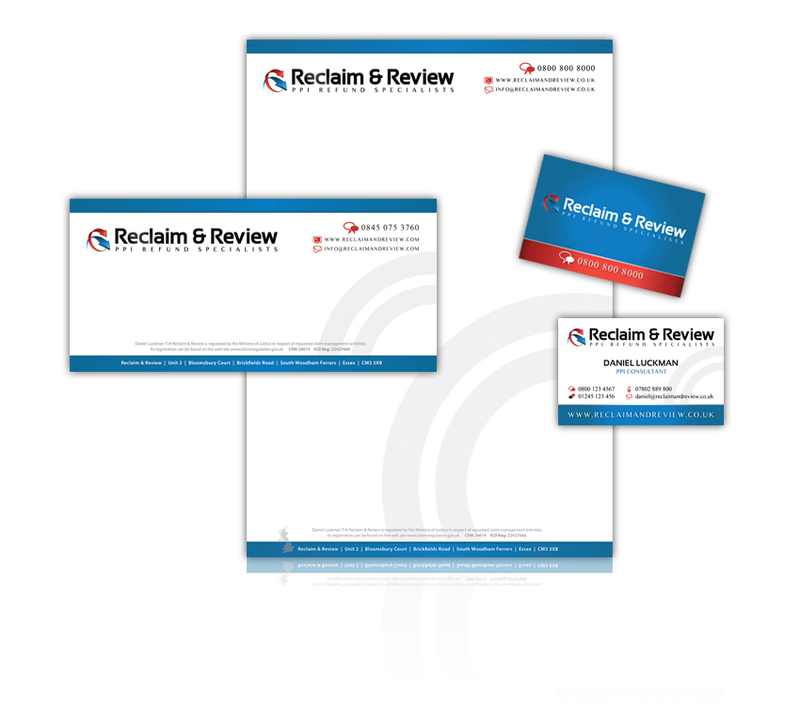 We exceeded their expectations and they decided to ask us to produce their company stationery and web site. Wanting something a little unique on their web design, we created flash animation incorporating a fashion reel to highlight popular products for purchase. "We thought the logo was great, then you produced the stationery and web site and for the price we are blown away. The printed stationery colours really pop, we are so pleased. The website looks brilliant and animation work you produced really sets it off. Then producing and uploading a standalone header we could use for our Ebay store was the icing on the cake, looks great. 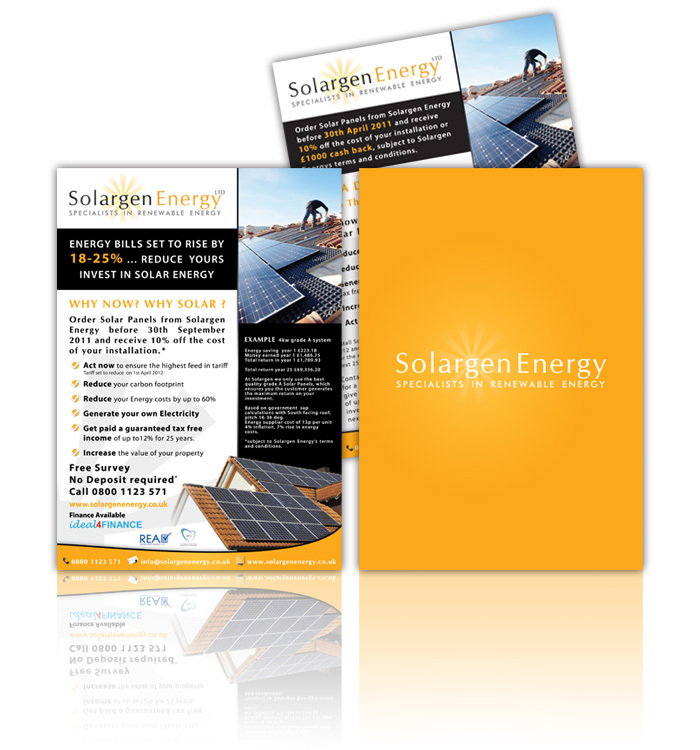 It's now just down to us to get our fancy dress catalogue uploaded to Ebay ;-)"
Solargen Energy needed a complete refresh, with branding, logo design, stationery design, flyer design and web design. We put together a comprehensive and cost saving design package and set to work. Since then we have created new pages and additions to the website and designed and printed a interlocking presentation folder. Many thanks for your time, again!." The team at Foundation came to us with an idea for a brand, working closely with them we created a timeless corporate brand that transfers seamlessly across all medias, applications and reflects the company accurately on an international level. 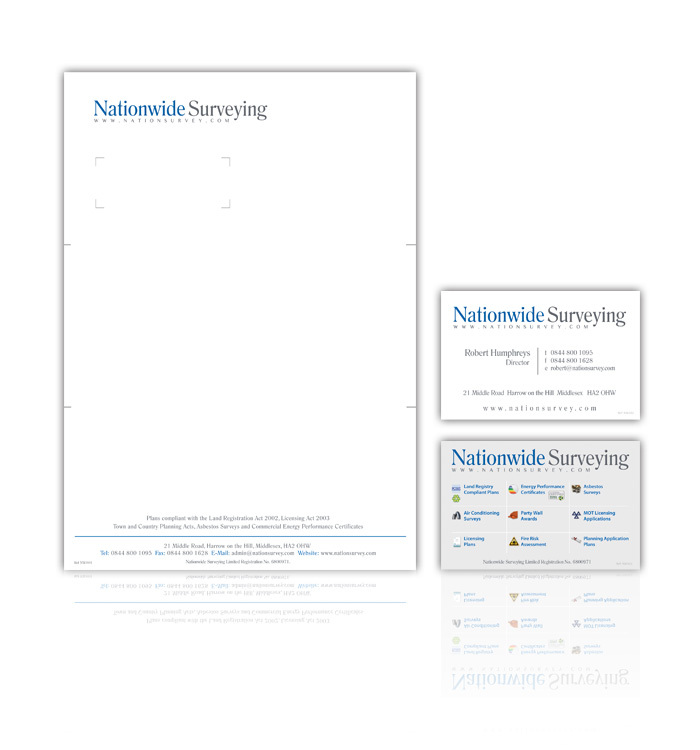 To promote the new brand we created corporate stationery and a bespoke web site. As part of our ongoing support we also manage their email accounts and provide website hosting and maintenance. "I really like what you have come up with, thanks Dan, you are a great help." Morse came to us with a brand in need of a refresh, so we worked with them to redevelop the brand and create a brand-new logo which is modern, has visual impact and provides a subtle indication to the line of business. 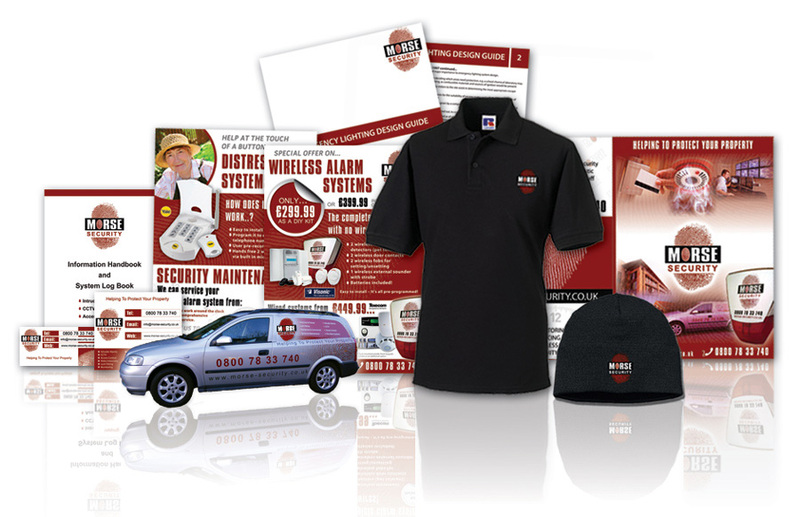 After working with us on the logo Morse Security have since worked with us to create their website, business stationery and various marketing items. As part of our ongoing support we also manage their email accounts and provide website hosting and maintenance. "The designs look excellent, fantastic job." "Thanks for doing an excellent job on the website." "I'm really please with the designs, the flyer looks great." 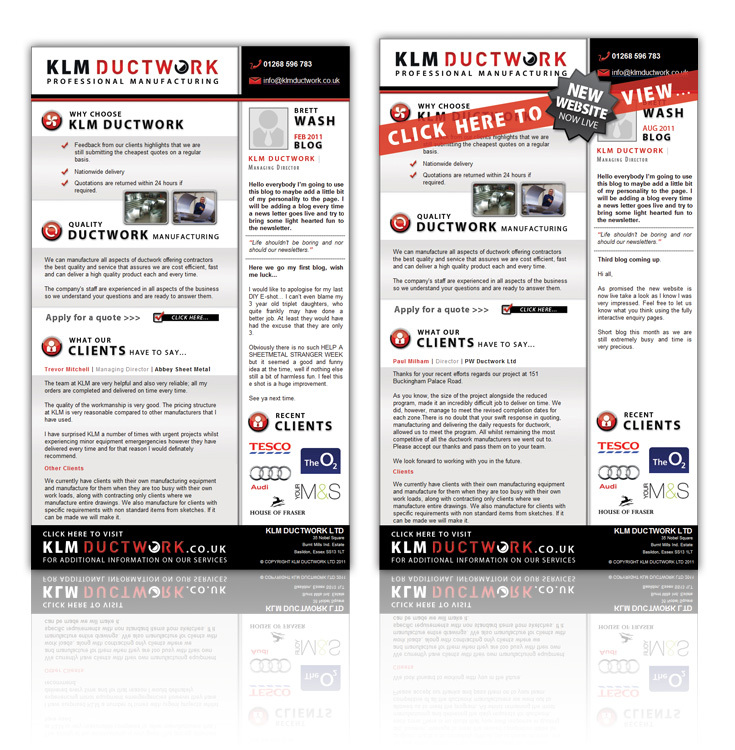 KLM Ductwork is an establish and great ductwork manufacturer who had an existing logo which was just text and an old fashioned web design which was hard to find. We created a logo design that immediately gave them a brand and then created a web design that set them apart from the competition. Through our basic search engine optimisation package we are now generating new leads for KLM for various search terms via Google. 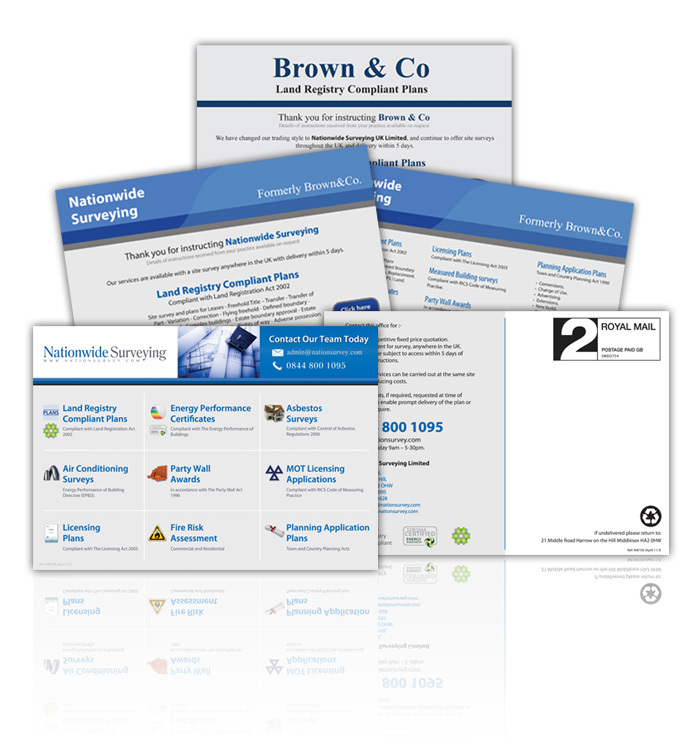 We also handle their email newsletter design and distribution on a monthly basis. "We love the new logo, thanks for that." "We are really impressed with the new website, outstanding job Dan." "I have received the newsletter and I’m happy and excited." 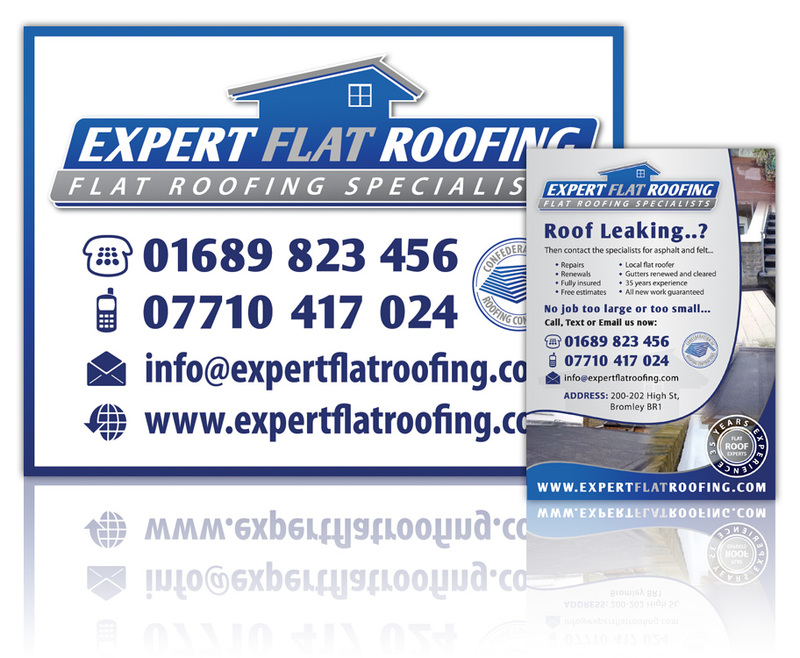 Expert Flat Roofing provide excellent and cost effective roofing solutions and required a logo design, printed stationery and a 1 page web design. 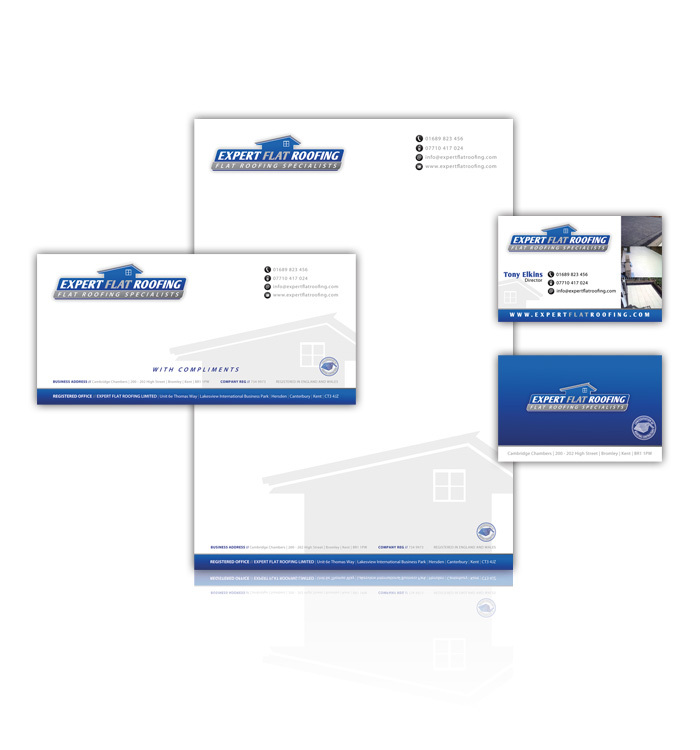 We created the brand, built the 1 page web site and supplied the printed stationery. 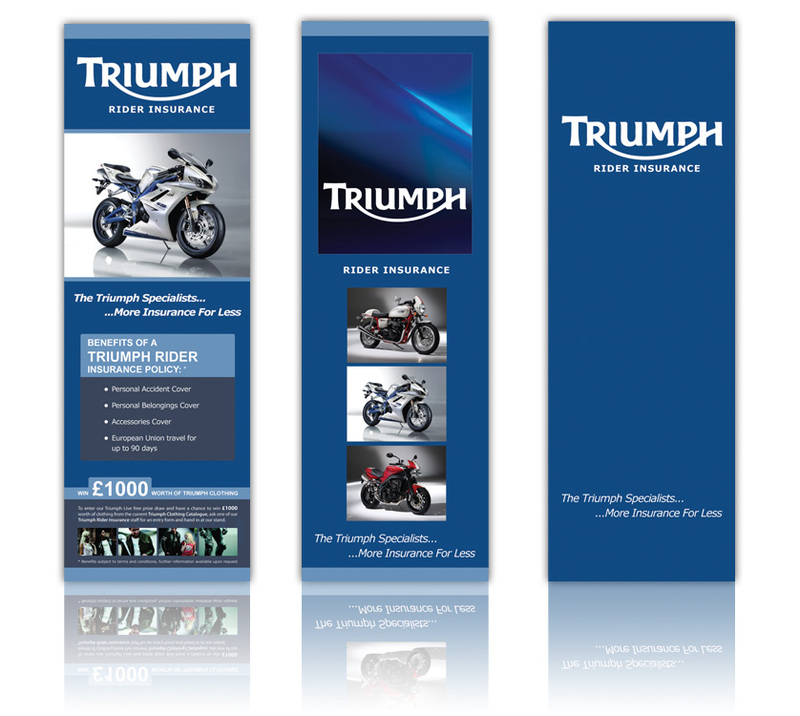 Since then we have also designed and printed leaflets, flyers and job advertising boards. "I am extremely happy with the web page, I think it looks fantastic. 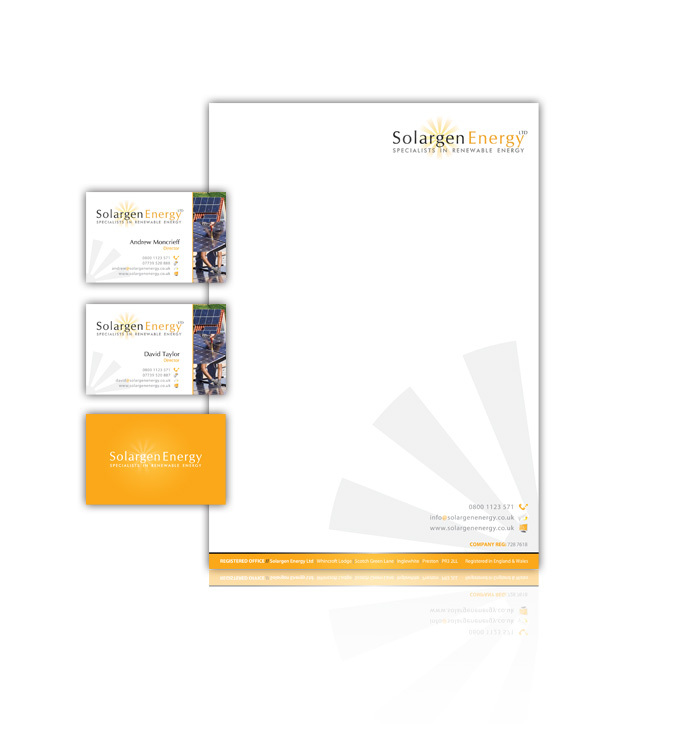 We love the business card, the letterheads look fantastic, really impressive designs. Many thanks for your help Sophie, Very pleased with our website and stationery. 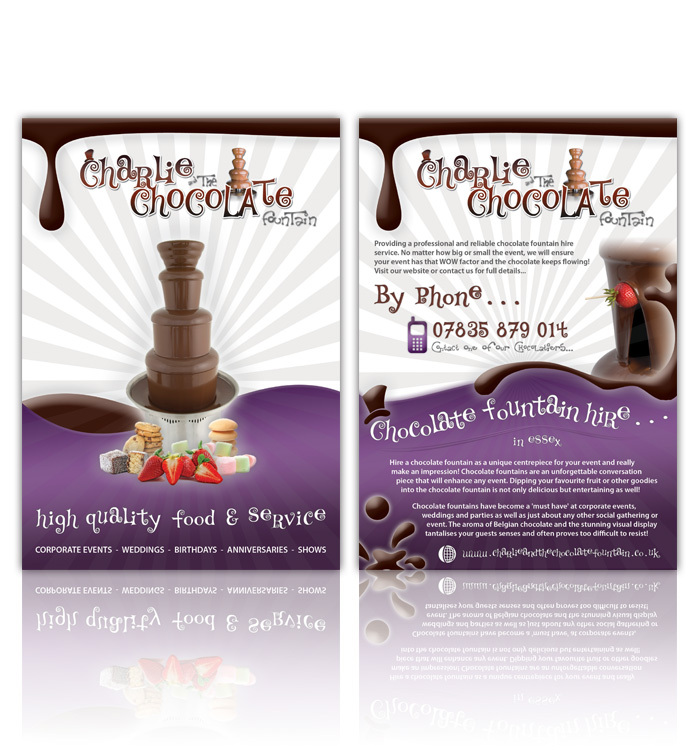 The flyers are great Sophie, love the printed leaflets and the boards also look great!!."